In May 2016, a trial excavation was conducted at the Kh. ‘Ali Qauqa(East) antiquities site (Permit No. A-7695; map ref. 211108–34/709720–34; Fig. 1), prior to the expansion of Qazir. 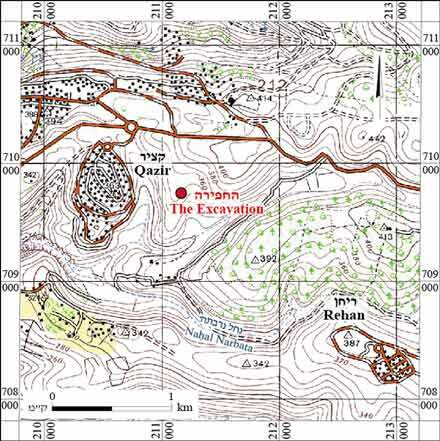 The excavation, undertaken on behalf of the Israel Antiquities Authority and financed by the Ministry of Construction and Housing, was directed by A. Massarwa, with the assistance of Y. Amrani and Y. Lavan (administration), R. Mishayev and R. Liran (surveying and drafting), P. Gendelman (scientific guidance), A. Dagot (GPS), A. Peretz (field photography), Y. Marmelstein, K. Saʽid and S. Davidov (IAA Haifa district). 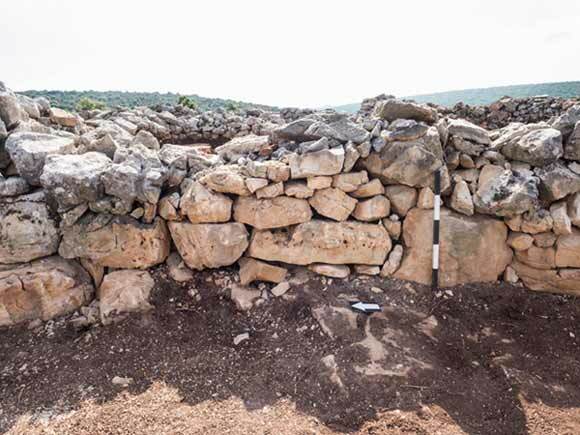 The excavation area was located on a hill covered with rock-fall and a tangle of thorny vegetation overlooking Wadi ‘Ara, Ramot Menashe, the Sharon plain and the Samaria foothills. At least five small artesian springs can be currently found within a radius of several hundred meters from the excavation area. 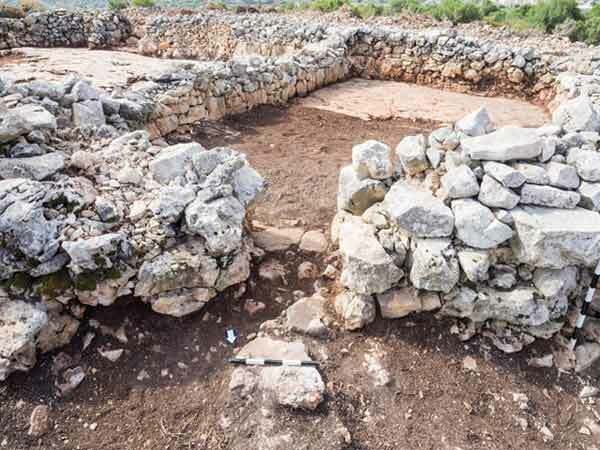 Remains of a large building (10 × 27 m; Figs. 2, 3) were exposed and documented. Three main phases were identified. Phase 1. An open courtyard (L121; 10 × 15 m) was erected with walls built of dry construction of roughly hewn fieldstones (0.3 × 0.3 × 0.5 m) and a fill of small stones. It was founded on the bedrock, which was leveled and prepared for use as a floor. 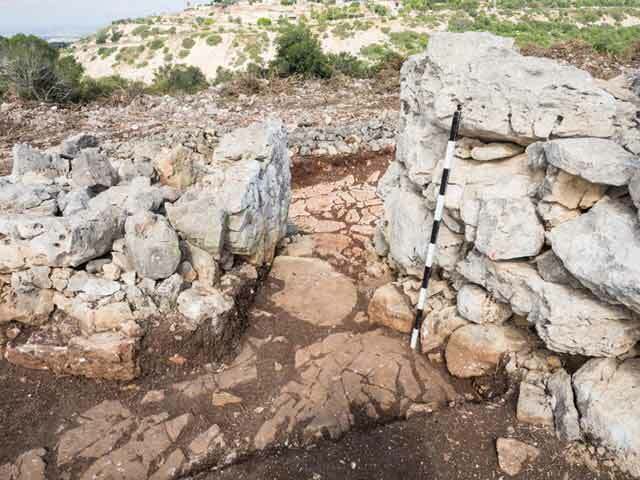 One entrance was set near the southeastern corner (L129), and another was adjacent to the northwestern corner (L131; Fig. 4). A rectangular room (L123; 5.0 × 7.5 m) was built east of the courtyard. It was founded on bedrock that was also leveled and served as a floor, and its walls were preserved to a height of five courses. The room was entered through an opening (L125; width 0.7 m) leading from the courtyard. Another opening (L122; Fig. 5), set in the west part of the courtyard, led outside, to an open space (L119); it was damaged due to modern construction work. An opening (width 0.2 m; Figs. 3: Section 2–2; 6), which served to drain runoff, was revealed at the base of the western wall (W104) in the lowest part of the courtyard. Phase 2. 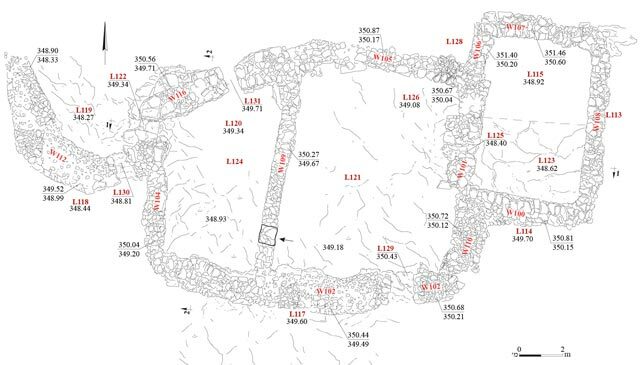 A wall (W109), which partitioned the courtyard from north to south and had an opening set in it (width 1 m; indicated in Fig. 2), was constructed during this phase. The wall was narrower than the other walls; it was built of dry construction of roughly hewn stones (0.2 × 0.3 × 0.5 m). Phase 3. The opening in W109 was blocked with fieldstones (Fig. 7). It seems that these are the remains of a simple farmstead, which over the years was divided into two separate units. The ceramic finds are extremely meager; consequently, it is difficult to date the structure. The few abraded potsherds recovered in the excavation are ascribed to the Roman period (second–third centuries CE). 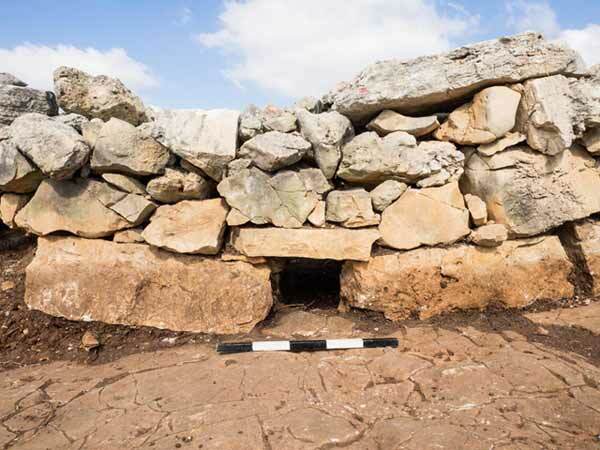 Judging by the nature of the complex, the site was apparently part of the agricultural hinterland of the settlement that existed at the site during the Roman period. 4. Entrance 131, looking south. 5. Entrance 122, looking west. 6. An opening to drain runoff at the bottom of W104, looking west. 7. The blockage in W109, looking east.